Can a Felon Become a Geologist? There are resources available for felons looking for a job after their release. Often it takes learning a new trade or starting a different career to demonstrate that felons make good employees. For those with experience in rock formations and natural processes, geology is a possibility. 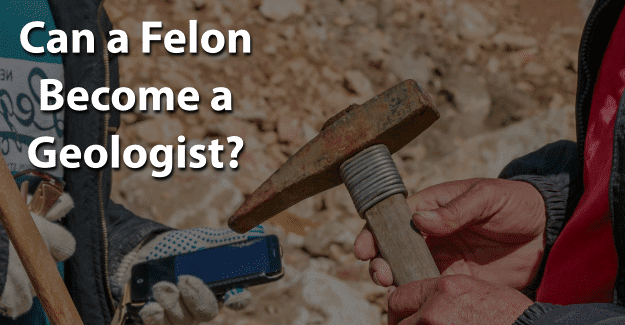 This blog post will address the issue of whether or not a felon can become a geologist. What is Required to Become a Geologist? How Much Does a Geologist Earn? Geology is one of the oldest of the earth sciences. A geologist studies rocks, rock formations, and physical attributes of the earth. He or she also examines the composition and structure of rocks, including processes that led to their formation. Exploration. Explores sites for coal, or, minerals, and stones. Geo engineer. Involved in environmental issues, especially water supply development. Geotechnical. Concerned with the structure of soils and rocks for construction projects. Typically, a bachelor’s degree is required to work as a geologist. Fortunately, most colleges offer a degree in geology. A license is required to become a geologist when the work directly impacts public safety. A license protects the public from unqualified and unethical practices, and establishes a degree of legal accountability for the work. Requirements for licensing differ from one state to another. A professional license is required to become a geologist in 29 states. Licensure is covered through the National Association of State Boards of Geology (ASBOG). Licensing is a quality-control process allowing the state to limit areas of professional practices to those who have demonstrated the qualifications to carry out that practice, and it helps prevent incompetent or unethical practices from occurring. An entry-level position in geology does not require a license. If the work of a geologist is within a company, a license is usually not required. Often, the work of a geologist in which a license is necessary is related to civil engineering as it often involves geographic hazards in engineering structures and land development. According to the U.S. Bureau of Labor Statistics, there are approximately 32,000 practicing geologists. The median annual wage for a geologist in 2017 was $89,850. The median income is the amount at which half of geologists earned more and half earned less. Level of experience and specialty certifications will affect how much a geologist earns. Location is also important with those working in the South and along the East or West coast having a higher salary than a geologist in other parts of the country. This area is expected to show a 14% job growth from 2016 to 2026, which is slightly above average. A felon can pursue any degree he or she wants. Approximately 60% of colleges consider criminal history in their admissions process, although there is no standard policy regarding a background check. Any felon that wants to get a degree to become a geologist can find a college that will accept him or her. A background check is typically done on those seeking a license as a geologist to ensure public welfare. Usually, this background check involves fingerprinting. All criminal convictions as well as cases in which someone pled guilty or no contest must be revealed, even if they were dismissed or expunged. If there’s any doubt regarding the report of a prior conviction, it’s best to disclose the conviction. It can present much more serious consequences legally if it’s found later. Failure to disclose a conviction is a violation of the law and can lead to legal disciplinary action beyond denial of a license. An applicant must report and provide certified copies of court records for any legal complaint, complete docket, judgment, sentence, and probation report for all convictions. Any arrest which did not result in a conviction doesn’t have to be disclosed. Convictions that aren’t related to the qualifications, functions, or duties of a geologist must still be revealed as information related to the crime may indicate its relevance to the practice of geology. An applicant will be given the opportunity to explain any criminal conviction in writing along with evidence of rehabilitation such as counseling, employment, or completion of an appropriate rehabilitation program. There are re-entry programs, such as drug treatment, and educational opportunities for felons who need them. For many felons, having their felony expunged can give them the chance they need to begin with a clear record and succeed in becoming a geologist. It’s a significant challenge, but it might be worth it for a felon that wants to become a geologist. Having his or her record expunged and also documenting any training programs or additional education could make the essential difference in a felon succeeding. Having support from family, friends, or previous employers can make a huge difference. A felon doesn’t have to be defined by his or her crime. We are not defined by our mistakes but by how we recover from them. He or she can begin again and live an honest, productive life no matter how challenging it might seem. What do you think about this blog post? Have you or someone you know been in the situation of trying to become a geologist with a felony? What was that like for him or her, and how did he or she achieve success? Please tell us in the comments below.